New Yorkers have certainly done their “share” to make Citi Bike a hit. 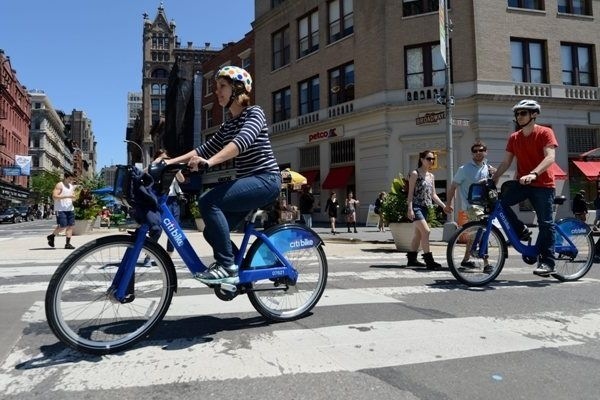 The inaugural summer of Citi Bike, which launched on May 27, has been a major success, according to the city Department of Transportation. More than 288,000 subscriptions have been registered for the bike share program through last Thursday. Today, the Metro paper had a story about how the popularity of Citibike has lead to many adults to learn how to ride a bicycle. Jackie Wasilczyk wobbled, struggling for balance and straddling a bicycle with no pedals on the East River Bikeway, when a young child whizzed by on his own two-wheeler. 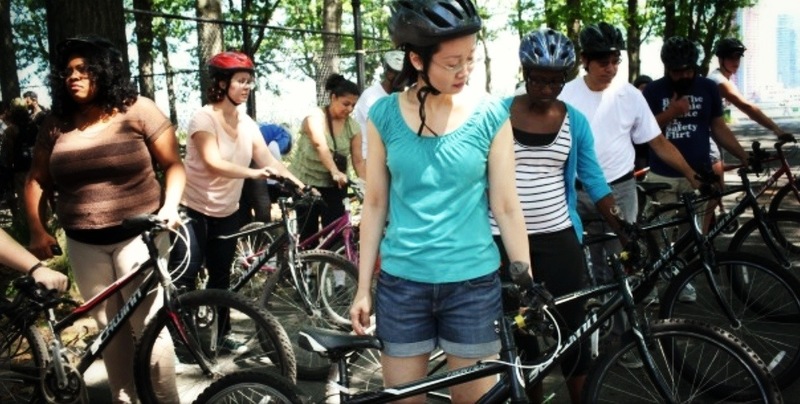 Many adults like Wasilczyk are turning to Bike New York, a nonprofit aimed at promoting cycling in the city, to learn a skill that’s becoming more useful since the bike share program launched in May. Unfortunately not all the bike news in NYC is so happy-feel-good. It turns out our beloved bike activist group, Time’s Up has been spied on and infiltrated. Not the best way to make it into the press but it is good to expose the reality of what’s going on and perhaps shed light on what may originally be thought of as conspiracy theory. Last week the New York Times revealed that NYPD documents highlight not only are the cops spying on Muslim groups but casting a wide net that includes Time’s Up who primarily provides such nefarious actives such as garden clean-ups and dance themed bike rides. These reports were confirmed by Pulitzer Prize winning AP journalists Matt Apuzzo and Adam Goldman, who identified that the NYPD were spying on Muslim groups as part of their demographics unit. A bicycle glides through the perpetual neon glow that suffuses Times Square to the foot of a military recruiting station. The rider dismounts and then bikes away. Seconds later, a bomb explodes in a gray cloud of smoke. It is early morning on March 6, 2008; thankfully no one is hurt. Three weeks later, the New York Police Department’s intelligence division filed a secret report claiming to have identified Dennis Christopher Burke, an anarchist, as a bombing suspect. Their evidence stood on the frailest of reeds. Mr. Burke, that secret report stated, might have posted a link on an anarchist blog, “Bombs and Shields,” to a news account of the bombing written by Fox News. The police acknowledged that they were just guessing. Their informers had last linked Mr. Burke to that blog three years earlier. Read the whole story: here. Since 9/11, the New York City Police Department has established an intelligence operation that in some ways has been even more aggressive than the National Security Agency. At its core is a spying operation targeting Arab- and Muslim-Americans where they live, work and pray. The NYPD’s “Demographics Unit,” as it was known until 2010, has secretly infiltrated Muslim student groups, sent informants into mosques, eavesdropped on conversations in restaurants, barber shops and gyms, and built a vast database of information. The program was established with help from the CIA, which is barred from domestic spying. Just last month, it emerged the NYPD has labeled at least 50 Muslim organizations, including a dozen mosques, as terrorist groups. This has allowed them to carry out what are called “Terrorism Enterprise Investigations,” sending undercover informants into mosques to spy on worshipers and make secret recordings. We’re joined by the Pulitzer-winning duo who exposed the NYPD’s spy program, Associated Press reporters Matt Apuzzo and Adam Goldman, co-authors of the new book, “Enemies Within: Inside the NYPD’s Secret Spying Unit and Bin Laden’s Final Plot Against America.” We’re also joined by Linda Sarsour, executive director of the Arab American Association of New York, which was among the groups targeted by the NYPD. It seems rather frightening to think that the NYPD would have deeper surveillance then the NSA and that this spying would extend to community groups who’s soul purpose is to make NYC a greener, sustainable and a more livable place, On the positive side, it’s good to know we’re not crazy when suspecting certain individuals of being cops or informants. The danger here is letting the cops break apart our community with their own unconstitutional behavior and the influence it can have due to paranoia and suspicion. Time’s Up has always thrived on volunteers to build the bicycle community and hopefully this type of information will only make it stronger.